Licensed From – Elektra Entertainment Group Inc.
Each LP is pressed onto 180 gram split red/blue vinyl and includes a full color photo booklet and a free MP3 download of the box set, transferred from vinyl. 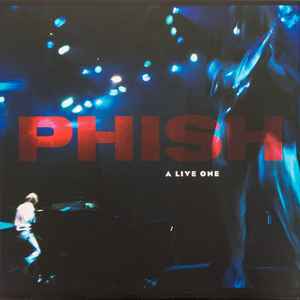 Recorded on multitrack DA-88 DTRS digital tapes throughout Phish's 1994 summer, fall and holiday concert tours. Mixed to 1/2" reels at Bearsville Studios, Bearsville, NY in March-April 1995. Mastered and cut from 1/2" flat masters at Bernie Grundman Mastering - May 2016. All songs copyright Who Is She? Music Inc.
My set sounds great except there is a huge audible scratch across side 4. Probably got scratched when a pressing plant worker pulled it off a cooling rack spindle. Buyer beware if you are thinking about getting one of these. GZ needs to tune up quality control, especially with pricey box sets like this. After some email exchanges with the folks at Jemp I was able to get the scratched record in my set replaced. Major props to them for coming through, even when they were out of stock and had to source it from a third party.